Hunt for Easter Eggs or Your Next Home This Weekend on The North Shore! Although it may not feel like it, spring has officially arrived and before we know it, Chicago’s North Shore will be budding with the beauty of the season. As a North Shore Real Estate agent, it’s an exciting time as the spring real estate market gets underway. Typically, it picks up with activity as sellers tackle necessary updates and put their home on the market for buyers who have been waiting for warmer weather to begin their home search. If you are on the hunt for a North Shore home this spring, I would love to help you find your ideal home whether in Winnetka, Northbrook, Deerfield, Glencoe, Highland Park or any other North Shore city! There are a number of beautiful homes on the North Shore market so you’re sure to find one that fits your lifestyle and budget! If you’re on the hunt for a buyer to view your home and sign the contract this spring; I would be happy to talk to you as well! I have experience in customizing home selling plans and getting my clients’ homes sold in a timely and efficient manner, and would love to do the same for you! No matter what your hunt is for this spring season, I hope you get the opportunity to join in on an Easter Egg Hunt this weekend to celebrate the Easter holiday. Here are a few you might enjoy! 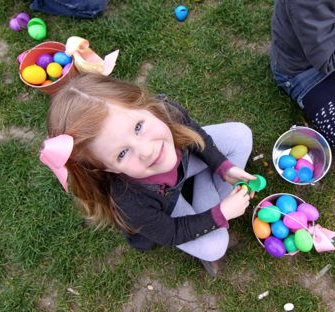 - Children ages 3 through 8 are invited to join the fun and excitement of hunting for goody-filled eggs in Winnetka’s annual Egg Hunt. Children 3 years and under are invited to join in the “Bunnies-in-Training” area where they can discover unfilled eggs. The Bunny himself will be there to help and children will be able to have their picture taken! The Winnetka Park District and the Winnetka Chamber of Commerce co-sponsor this FREE event. Please bring your basket and get ready for some Easter fun! - Bring your children ( 0-12 yrs) to Jewett Park in Deerfield, near the fieldhouse on Saturday March 30th for the Deerfield Optimists annual Easter egg hunt. Children will hunt in 3 different age groups. This free event is full of fun! Pictures can also be taken with the Easter bunny! - Enjoy the Chicago Botanic Garden while feasting on the mouth -watering buffet! This beautiful setting and delicious brunch will become a favorite holiday tradition! After the brunch, hop over to the Rose Garden with your basket for an Easter Egg Hunt before enjoying the rest of the Gardens beautiful spring flowers! I look forward to hearing from you and helping you with your buyer or house hunt this season! Get the Service You Deserve from a North Shore Real Estate Agent! It’s not often that I take a step back from providing you with up to the minute real estate news, home buying and selling tips, as well as information on the North Shore lifestyle. However, I love what I do as a North Shore Real Estate agent and want to give you further insight into my services, experience, professional backing, and why choosing a North Shore Real Estate agent can be the key to your success! I’ve served the North Shore communities of Glencoe, Highland Park, Winnetka, Northbrook, Deerfield and the surrounding areas for over twenty-five years, and can’t imagine myself doing anything else! The real estate industry can be grueling but, as with any profession, no matter the highs and lows- if you love what you’re doing; it’s well worth it! For me, I enjoy helping buyers find the exact home that fits their needs, budget and lifestyle, and that also exceeds their expectations. I also take great responsibility in guiding sellers through the home selling process and ensuring they’re happy with the results. And, although I work hard on my own for my clients; I’m also supported by one of the leading real estate companies in the nation: Coldwell Banker. Coldwell Banker is the oldest and most established residential real estate franchise system in North America, and it is known as one of the most innovative, forward-thinking real estate brands today. Coldwell Banker was the first full-service real estate brand to launch a national website, stream listing videos online, create social media and iPad applications, design mobile-friendly sites and more. Coldwell Banker will "never stop moving" and will always be at the forefront of providing exemplary service and trusted counsel to home sellers and buyers, in addition to best-in-class support and educational tools for its network of real estate professionals. This is just one of the many ways that you’ll find the support and experience you need from Coldwell Banker and my services as your North Shore Real Estate agent. Still not sure if choosing an agent is the way to go? Check out these seven reasons why choosing a North Shore Real Estate agent will help you find the greatest success in your real estate endeavor! 2. Area Knowledge- If you’re buying a Chicago North Shore home and are relocating to the area, your North Shore Real Estate agent will know the best places to search to fit your needs and lifestyle! 3. Price Guidance- Your North Shore Real Estate agent can guide you in what you want to offer on a home and help you come up with a price that works within your budget. They can also give you advice on pricing your home correctly from the beginning. 4. Market Condition Information- You’ll get an inside look into the North Shore Real Estate market such as what homes are currently selling for on the market or when a home is a good deal. 5. Professional Networking- Your North Shore Real Estate agent may already have a connection to an interested buyer for your North Shore home! They will also have contact with other North Shore Real Estate agents and brokers and can get the word out about your home being on the market. 6. Negotiation Skills- Negotiating a contract can be tricky and your North Shore Real Estate agent will be able to navigate through this process to ensure you are happy with the deal. 7. Develop Relationships for Future Business- Finding a trusted North Shore Real Estate agent can be tough, but once you find one; you’ll want to develop a great relationship with them! Whether you are looking to buy or sell again in the future, you know that they’ll be your first choice so building that relationship is key! I hope this helps in making you feel even more confident in what I can do for you! If you have further questions about Coldwell Banker, the North Shore Real Estate market, or about my services; please feel free to contact me today! Enjoy St. Patrick's Day on Chicago's North Shore! One of the things I enjoy about living on Chicago’s North Shore is the closeness of the communities and the vibrant lifestyle that each has to offer. Whether you live in Winnetka, Glencoe, Deerfield, Highland Park, Northbrook or any of the surrounding cities; you’ll enjoy each community! If you’ve stopped by my blog, chances are you’re searching for a home on the North Shore or perhaps you’re looking to sell your current home. As a North Shore Real Estate agent for over twenty years, I can assure you that you’ve come to the right place! I have helped many buyers and sellers over the years navigate through the North Shore Real Estate market. Yet, my services don’t stop simply at the property. I want to ensure that those relocating to the North Shore get a good sense of each community by highlighting things such as local restaurants, events, schools, community interaction and much more! The old adage, “Location, location, location!” rings true whenever you buy a home, and I want to make sure you’re as comfortable as possible with your North Shore home purchase. In light of this, I thought it would be fun to feature one of the cities in the North Shore that I don’t often talk about, but is a great community! With St. Patrick’s Day this weekend, I found there was a lot taking place in Evanston that you may just want to check out! - In the mood for a tasty Irish treat? Bennison’s is serving up classic Shamrock cupcakes, coffee cake and cookies! Feeling extra lucky? Try one of their delicious chocolate Irish potatoes, Irish soda bread, Irish petit fors, Irish Whiskey cake and much more! 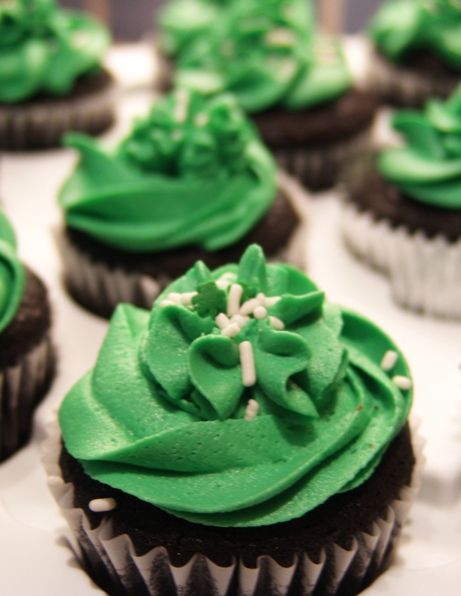 View more sweet treats on the Bennison's Bakery website. - For a true taste of Ireland, be sure to visit the local pub! Enjoy an entire week of St. Patrick’s Day fun at this authentic pub in Evanston! - When you think of St. Patrick’s Day, sushi may not be the first thing that comes to mind! Yet, you can go green with KOI on March 17! Enjoy special GREEN menu items including vegetable dumplings, edemame and green tea ice cream. View more about this green meal online at KOI. Whether you’re Irish or not; you’ll be sure to enjoy celebrating St. Patrick’s Day along the North Shore! If you are considering relocating to the area, I would love the opportunity to talk with you. I would be happy to talk about your home buying needs and even show you some of the beautiful homes currently available on the North Shore Real Estate market! Have a safe and happy St. Patrick's Day! Winnetka Active Listings: There are a total of 117 properties actively on the market with the average price of $2,289,817 in Winnetka. Winnetka Sold Listings: 6 properties closed last month in Winnetka with an average sales price of $884,583, the average time on market for these properties was 126 days. Glencoe Active Listings: There are a total of 69 properties actively on the market with the average price of $1,718,878 in Glencoe. Glencoe Sold Listings: 4 properties closed last month in Glencoe with an average sales price of $1,550,000, the average time on market for these properties was 150 days. Northbrook Active Listings: There are a total of 136 properties actively on the market with the average price of $681,653 in Northbrook. Northbrook Sold Listings: 31 properties closed last month in Northbrook with an average sales price of $408,320, the average time on market for these properties was 101 days. Deerfield Active Listings: There are a total of 92 properties actively on the market with the average price of $555,551 in Deerfield. Deerfield Sold Listings: 17 properties closed last month in Deerfield with an average sales price of $277,535, the average time on market for these properties was 124 days.